R.B. Grant are trained installers for electric vehicle (EV) charging points, We supply and install Commercial EV Charging Points all over Scotland from our Fife base. R.B. Grant are approved installers of Elektromotive. R.B. Grant supply different types of commercial charging equipment to satisfy all our clients requests. We offer a full design, advice and installation service including ground works and electrical installation allowing you to charge your electric vehicles in perfect conditions, safely, easily and with a shorter charging time. The installation of an EV charger at home is an important point if we want to see the market of the electric vehicle becoming a major part of the transport industry in the future. But it’s not enough, Charging your car just at home does not allow the client to use their car whenever they want and can limit the distance the electric vehicle can travel. The solution to this problem is to install public vehicle chargers in the streets / parking bays for everyone to charge their cars vehicle. 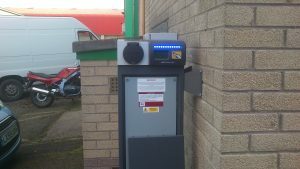 Commercial vehicle charging equipment for businesses can also be installed for businesses to charge company cars and cans. These types of systems are programmed in mode 3 or mode 4 to allow faster and safe charging points. The majority of electric vehicle chargers are installed at domestic properties, several other charging solutions are installed in the streets across the UK. It is very important to maintain and install more charging points through Britain so people have more opportunities to charge their vehicle. If the client is travelling a far distance they require a charging point to recharge before their journey home, It will be a greater benefit to customer to find charging points in streets. The Government is trying to increase the number of points all over Scotland and the United Kingdom. Elektromotive are a leader in this sector with their Electrobay. R.B. Grant are approved installers of Elektromotive. You can also find EV charging points developed by other EV manufacturers in the streets. There are a several of different types of charging points with different sockets to meet all clients needs (normal socket, 5pins and 7pin) with either single-phase or three-phase outlets and different characteristics. At the moment it is not that easy to find a charging point in the street but that number will increase in the next few years. The government need to increase the number of low carbon solutions especially for the transport industry that is why EV will become a major part of the transport industry all over the world.The number of public charging points will increase and access to a charger will be easier and more convenient in the future. The chargers are strategically placed where it’s easy to find them with parking facilities close enough to the charging point so the cable can safely reach the vehicle. To allow customers to use charging points they are situated in convenient places with easy access for the EV. R.B. Grant supply and install Commercial charging point solutions for companies that use electric vehicles and want to reduce the environmental impact for their business. A lot of companies in Scotland use vans every day that is why use an EV is a really good opportunity for them to reduce carbon emissions. We have a range of charging equipment that are suitable for a variety of vehicles with different characteristics to meet all our client’s needs. R.B. Grant will survey your work premises electrical installation and install your electric vehicle charging point in a convenient location. The most suitable location for a charge point install is in a garage or secure parking facility and then we will install wall mounted or ground mounted points with easy access that are suitable for the client. After the installation R.B. Grant will fully certify the charging point installation and show the client how to fully use and benefit from the system. The charging point has a dedicated circuit breaker to protect all the electrical installations within your property and a special connection to earth to protect against unwanted energy between the property and your electric vehicle. Charging points require a specific protection (TT installation) which separates the earth of the charger from the earth in your property. In Commercial properties you have different kinds of protection for people and devices, your grid installation will be different from Domestic properties and will not protect the charging point and the user. When we survey your property for a home electric charging point we will provide a specific earth installation and a dedicated circuit. We can provide either single-phase or three-phase installations with a variety of Elektromotive chargers (mono, double and combi sockets for different utilities) for clients to choose the best solution to suit their individual requirements. For these installations (commercial domestic) you can also install special charging points that convert the three phase current to DC current for the battery. This type of system reduces the battery charging time to around twenty minutes, This is a more efficient, reliable and expensive system. Contact R.B. Grant Electrical Contractors if you are interested in the installation of either public or commercial charging points.